Are you writing valuable blog posts, but you wish more people would leave comments? Do you wish some of your visitors would share your blog posts more often? The most successful blogs are the ones that get readers to engage with the content. The more readers engage with the content by reading and sharing it, the more likely those readers are to come back, view more of your content, and eventually buy your products. However, the majority of blogs on the web are not getting the amount of engagement they deserve. Some bloggers are writing valuable content, but that valuable content does not have any comments or social shares to show for it. Even though some of these blog posts may be getting traffic, conversations are not developing, and visitors are not sharing them enough. 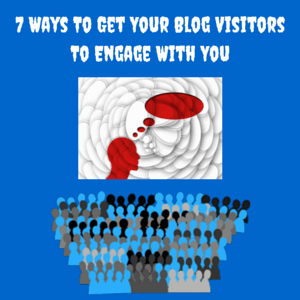 In order to boost engagement in your blog posts so more people comment and share them, follow these seven methods. Many people read a blog post’s headline to determine whether that blog post is good to read or not. Visitors who get confused by the headline don’t bother reading the rest of the content. It is the catchy, informative, hilarious, stunning, and headlines with numbers/statistics/case studies that bring forth attention. You can either focus on one of those elements or combine multiple elements together. It is possible to write an informative blog post headline with some numbers included. It is also possible to write a blog post headline that indicates a hilarious case study. One of the easier ways to write better headlines is by looking at how the top people in your niche write their headlines. What are the common patterns that the top people in your niche use? Once you identify top patterns, see how you can replicate these top patterns while putting in your own personal touch. Did you know that asking questions is a great way to perk up a reader’s interest in your content? Asking questions throughout your blog posts, especially at the beginning, adds the conversation component to your blog posts. Many bloggers write their blog posts like one-sided conversations that basically say, “Do this. Do these other things. Here’s a nice summary of what I said. You’ll do fine.” Some blog posts forget the 4th part because the typical blogger is so focused on providing value. The 4th part is having a conversation with your reader. Asking questions allows the sense of having a conversation to return to our writing. When you have a conversation with a reader through your writing, that reader will be more likely to continue the conversation by leaving a comment. Maybe the reader enjoyed the conversation so much that the reader will share your blog post on one of her social networks. Ask, and you will receive more times than not. Why not give it a try? That’s what I thought when I added a final paragraph that encouraged comments, and I have been pleased with the results. In this final paragraph, you can simply summarize the blog post, ask a few questions, and then ask your readers for their opinion about your article or if they would like to contribute (does the reader have another tip that she would like to share?). Asking questions in your blog posts brings back that sense of having a conversation. Commenting allows your readers to continue that conversation. However, many bloggers make the mistake of turning the comments section into a one-sided conversation. These bloggers simply approve each comment they get without responding. Some of your readers want to have conversations on the web, and if you have a big audience and great credentials, people will enjoy having a conversation with you. There are a group of people with incredible credentials that we would all want to have a conversation with. The people in this group differ for every individual, but we have that group of people who we would like to talk with. Some of your most devoted readers will regard you with such high esteem that, for the reader, you may fall into that special category. When you respond to all of the comments you get, there is a chance that you respond to a reader who greatly appreciates what you do. You may notice that I make it a point to respond to every comment I get. Responding to comments allows me to build stronger connections with my readers, know who visits often, and even have long conversations with one person about one blog post. Having a conversation with your reader is like giving them the free prize they didn’t expect. Many of them will come back, read your blog often, and comment on other blog posts that you write (and therefore have more conversations with you). Some readers may feel encouraged to comment because they know I will respond to them. Responding to comments also doubles the total number of comments my blog posts have. If 10 different people comment on one of my blog posts, the blog post actually shows up with 20 comments because I respond to all of the comments. The higher number builds social proof (a blog post with 20 comments must be getting more attention than a blog post with 10 comments) that leads to more people reading that particular blog post and then leaving their own comments as well. No matter how many questions you ask in your blog post, readers are only going to read a blog post from start to finish if that blog post provides value. The value is ultimately what makes readers read entire blog posts and want to comment at the end. You have no control over whether the reader comments on your blog post or not. The only way your reader is going to comment is if that reader wants to leave a comment. Valuable content will encourage the reader to leave a comment, often out of gratitude. Then, follow through by responding to the comment, and you may end up having a long conversation with one of your readers. These long conversations are good because some readers who have long conversations with you may feel inclined to buy your products. Some of the visitors who stumble across your blog may decide that the first blog post they read is not the right one for them. If a reader interested in Twitter advice first stumbles across about Instagram advice, then the Instagram blog post is not the right one for that particular reader. Many readers who feel as if the content is not the right content for them will look for something else to read (either another article on your blog or someone else’s blog). It is at this point when many readers click on the back button. On blogs that are optimized to solve this issue, readers who initially did not find what they were looking for don’t click the back button. Instead, they find a desirable article on your blog before clicking the back button. These optimized blogs make it easy for visitors to view categories, popular articles, and the archives. The more organized your blog is, the longer people will stick around. Another factor that will make people stick around for a longer period of time is the length of your blog posts. Longer blog posts get people to stick around for a longer period of time. In less than one month after writing longer blog posts, I was able to get my visitors to stay on my blog from an average of one minute and 20 seconds to an average of two minutes and 10 seconds. That is a dramatic increase in the blogging industry. Readers who read your content for a longer period of time will be more likely to comment on your articles. I believe this method is one of the most forgotten methods to get more comments on blog posts. There are some readers who comment on certain blogs because they like the blogger. This is one of the best ways to get more comments on your blog because it establishes a powerful connection between you and the reader. These are the types of connections that lead to returning visitors, subscribers, customers, and opportunities. Getting more people to comment on your blog posts no longer has to be impossible. Although implementing these tactics may not bring forth overnight results, these methods will help your blog posts get more engagement over the long-term. This engagement is crucial towards strengthening the relationship between you and your readers. You can tell who your most devoted readers are based on the number of comments they have left in the past. How did you like this blog post? Which tip was your favorite? Do you have any additional tips for us to boost the engagement we get from our blog posts? Please share below.